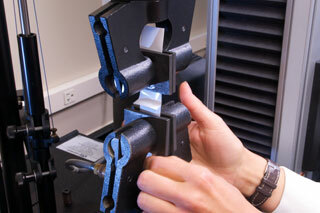 Nelson Labs offers multiple strength and integrity tests for packages depending on packaging type, configuration, and end points. Strength tests include seal peel and burst testing. Integrity tests include bubble emission and dye migration. Additional tests for whole package integrity are also available. Nelson Labs has significant experience performing this test in compliance with ASTM F88 and ISO 11607 “Packaging for terminally sterilized medical devices,” and we’re actively involved in the ASTM committees. The Seal Peel test is performed by cutting a 1-inch segment of the samples from the appropriate seal (sponsor and/or manufacture seal). The samples are then placed into the Instron grips and the machine pulls apart the seal using three possible methods: unsupported, 90° supported, and 180° supported. In the Burst test, porous packages are prepared by placing tape over the porous surface to reduce the rate at which air escapes. The set-up packages are used to experimentally determine the correct pressure, flow, and time required to burst the samples. A probe is inserted into the sample package through a package port, and the machine inflates the package until it bursts. The machine records the burst pressure. The burst failure location is also recorded. The Bubble Emission test begins by setting the pressure gauge to 10 + 2 inches of water. A packaging port is attached to the center of the sample and a probe is inserted through the port. The package is then submersed into an immersion fluid and inflated. Evidence of bubble emission through the package is considered a failure. In the Dye Migration test, a needle is inserted through the polyethylene surface of the package and the dye solution is injected with a syringe. The package is placed into a vertical position so that the dye comes in contact with the seal. The weight of the dye solution is maintained against the seal for a specific amount of time. If a surfactant has been included in the dye, the weight of the solution is maintained against the seal for a maximum of 20 seconds. If the package is exposed to the dye solution for a greater length of time, the wetting agent will cause the dye to wick through the package material. Evidence of water slipping through the seal is observed. The package is reoriented so that each portion of the seal comes in contact with the dye for the same amount of time. Evidence of dye slipping through the seals will be considered a failure. If you have additional questions about Packaging Integrity and Strength testing services, or would like to consult with the experts at Nelson Labs, just send us a request or call us at +1 (801) 290-7500.